Speaking tour addresses human rights abuses in the Philippines | Fight Back! 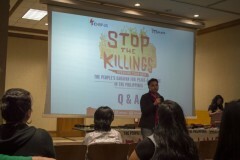 New York, NY - On April 26, a tour called “Stop the Killings Speaking Tour: The People’s Caravan for Peace and Justice in the Philippines” made a stop in New York City. The tour, hosted by International Committee for Human Rights in the Philippines (ICHRP US) and the MALAYA Movement, exposes the gross human rights violations that occur daily in the Philippines under the U.S.-backed Rodrigo Duterte regime. The tour is comprised of human rights experts and survivors of acts of repression. These speakers will visit seven major U.S. cities from coast to coast. The evening in a crowded room of over 100 people who were taking pictures with posters of slogans that read, “Stop the killings” and other anti-Duterte signs, followed by speakers from the Philippines, cultural performances and an update on the case of Jerome Succor Aba. The next speaker from the Philippines was Fritzi Junance Magbanua, an indigenous educator and administrator at the Mindanao Interfaith Services Inc. (MISIFI). Magbanua touched upon Duterte’s comment that he would bomb Lumad schools. She explained how the regime followed up on that promise and how one of her students was brutally murdered by troops who ‘mistook’ him for one of the rebels. She explained how the resistance grew by students and what they were doing to fight back. A ripple of hushed exclamations were heard throughout the room when she showed a picture of a wooden microscope that the teachers built because their schools didn’t have enough funds. The evening ended with Bernadette Ellorin, from BAYAN USA and the International League of Peoples’ Struggle, who gave an update on the case of Jerome Succor Aba, a 25-year-old peace activist from Mindanao. Originally, Aba was supposed to join the tour, but when he flew into the San Francisco airport on April 18, he was barred from entry. Regardless of the visa approved by the U.S. government, Aba was interrogated and tortured for 28 hours. He had no access to a lawyer, was given pork to eat, which goes against his religion as a Muslim, and was denied access to the phone. He was ordered to strip down naked and stand in front of an industrial cooling fan, called names, and taunted with a gun and grenade. After the harrowing ordeal, Aba was deported to the Philippines. The next moves by Aba and his team is to follow up and pursue an avenue to fight back against the horrendous events that transpired. They will continue fighting for justice.